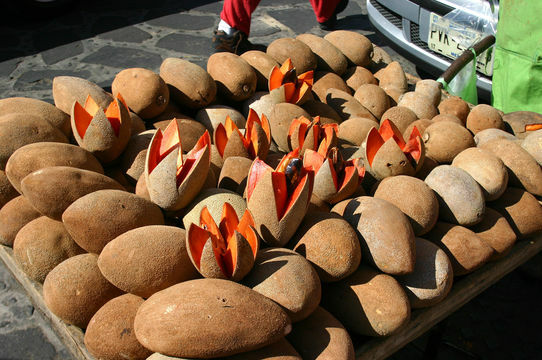 Mamey sapote occurs wild in the humid lowlands of Central America and southern Mexico. It is a fruit of very ancient cultivation and was and an important fruit in Mayan culture. It is now widely cultivated from Mexico to northern South America and the West Indies. It was also taken to South East Asia quite long ago. Mamey sapote has been grown in Florida (united Stated) for at least a century. An erect evergreen or deciduous tree, 7-20(-40) m tall, trunk up to 1 m diameter, often narrowly buttressed, bark brownish and shaggy, crown narrow or spreading, often strongly branched; latex white, gummy. Leaves spirally arranged, clustered at the end of branches; petiole 2-5 cm long; blade obovate to oblanceolate, 10-30 cm x 4-10 cm, acuminate at both ends, glabrescent, pale brownish below, nerves prominent at both sides. Flowers in clusters of 6-15 in the axils of fallen leaves along the branches, sub sessile, bisexual, white to pale-yellow, small, 5-merous; calyx with 8-12 silky, rounded lobes, 5mm long; corolla tubular and with 5 blunt lobes; stamens 5, staminodes 5; pistil 8-10 mm long, ovary 5-celled. Fruit a globose, ovoid or ellipsoid berry, 8-20 cm long, often bluntly pointed at apex, weighing 0.25-2.5 kg; skin dark-brown, rough, firm, leathery to semi-woody, up to 1.5 mm thick; flesh pinkish to dark-red, soft, sweet. Seeds 1(-4), spindle shaped, 5-8 cm long, hard, glossy brown; hilum rough, large, whitish; kernel oily, bitter. The pulp has a pleasant, aromatic sweet taste and is free of acidity and fibre. These are eaten fresh. Some people like to spoon out the pulp from the firm rind. The fruits are also added to ice creams. Nutritive value: 100 g pulp contains: water 55-73 g, protein 1-2 g, fat 0.1-0.5 g, carbohydrates 26-32 g, fibre 1-3 g, calcium 20-40 mg. iron 0.5-2 mg, phosphorus 23-33 mg, vitamin C 20-40 mg. The energy value is 525 kJ/100g. In Central America the mamey sapote has many other uses. It is used as a shade tree in coffee plantations since it loses its leaves when coffee needs ample sunlight. Its heartwood, which is easy to work and fairly durable, is used in construction and for making carts and furniture. The milky latex from bark and fruits is used as an anthelminthic and emetic, to remove warts, and to cure fungal shin infections. The seeds contain white semi-solid oil called sapuyulo or zapoyola, which was formerly used to fix paintings on gourds and other handicrafts. It is still used as a sedative in ear and eye ailments, and as skin tonic and hair revitalizer. Its effect in stopping loss of hair caused by seborrhoeic-dermatitis has been confirmed in clinical tests. The oil is therefore said to have potential in the soap industry and in pharmaceutical and cosmetic products. The seed residue is used as a poultice on skin afflictions. In Mexico the seeds are milled and used in a number of confectioneries and, alone or with cacao, to prepare a bitter chocolate. Mamey sapote is best adapted to the lowland humid tropics with a fairly even distribution of rainfall. It requires a hot climate, but mature trees can tolerate occasional, very light frost. This fruit grows well on a wide range of soils from heavy clays to sandy clay and also on light limestone soils. Water logging is not tolerated. 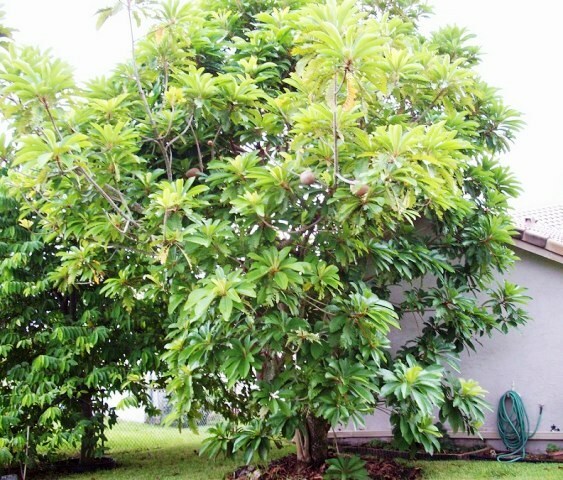 Mamey sapote is a slow growing tree. The seedlings come into production after 6-8 years of planting when raised from seed. But the trees are very long lived and may continue to produce for over 100 years. The fruits take nearly a year to mature and young and ripening fruits can sometimes be seen on the same tree. The mamey sapote is mostly grown from seed. The seeds germinate in 3-5 weeks. Seeds lose viability quickly and must be planted soon after removal from the fruit. Vegetative propagation-by grafting-is difficult, mainly because of poor drought tolerance and limited callus growth of the scion. However, veneer, tip and approach grafting are successful and are now done routinely. 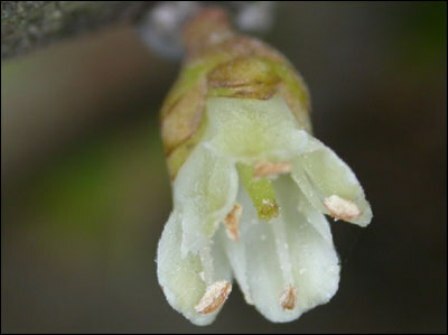 Graft wood should be taken from branches which have flowered. Lateral buds are forced by cutting the leafy shoot tip off and waiting for 2 weeks before cutting the scion wood. Canistel (Pouteria campechiana) can be used as an alternative rootstock. The recommended spacing is 8 m x 8 m, but planting densities vary from 80 to 160 trees per ha depending on growing conditions and cultivar. Planting holes should be large and well-manured. There are many varieties of this fruit. Some of there are Cayo Hueso (Dominican Republic), Copan (Cuba) which has a medium sized fruit with red flesh, excellent quality, containing 1 seed. ‘Magana (El Salvador) has very large fruits with pink flesh of excellent quality and 1 seed. Trees do not require elaborate care. Initial shade, mulch and a cover crop are beneficial. Application of a balanced compound fertilizer is recommended when the tree is fruiting. Some pruning is often needed to open up compactly growing trees; in fast-growing cultivars, topping facilitates harvesting. 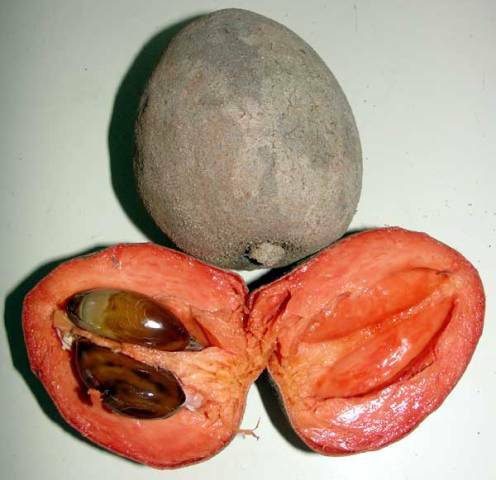 Few diseases and insects attack the mamey sapote and damage is rarely significant. During the rainy season, anthracnose (Colletotrichum gloeosporioides) causes sooty spots on leaves and pedicels. If the latter are affected, the fruit is likely to drop prematurely. Mature fruits are not affected. Other diseases reported are leaf-spot (Phyllosticta sapotae), black leaf-spot (Pyllachora sp.) and root rot (Pythium sp.) Among insect pests, the West Indian sugarcane stalk-borer (Diaprepes abbreviatus), the adults of which attack the leaves and the larvae the roots, should be mentioned. Scale insects, termites and red spider mites are other common pests. It is not easy to determine the best time for harvesting. In some cases fruits can be picked when they start turning red, in others samples have to be taken judge the colour of the flesh. The fruiting season in the Philippines is March to May. Fruits should not be picked when the shoots are actively growing, as they will not ripen completely. In tall trees harvesting poles and baskets are used. After picking, the stalk is trimmed and fruits are packed in boxes or baskets. The fruit is climacteric and mature fruits take a few days to ripen. Mamey sapote is becoming popular at all the places where it has been introduced. Moreover, it has a long shelf life and can withstand transportation. So this fruit, if promoted, can turn out to be a profitable new fruit crop. Its cultivation should therefore be encouraged.